Ahh...drifters. The illegitimate offspring of international racing and Hollywood drivel. We love the big-capped tykes like they were our own - especially when they come in a package as unassuming as Rhys Millen and Ryan Tuerck. Both men look better suited to filling out your tax return than sliding round corners, but between them they possess more than enough talent to keep one of Atlanta's busiest streets spellbound. 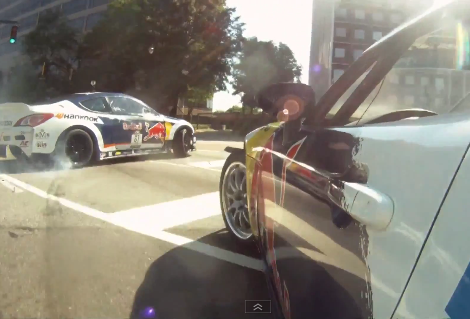 The pair were in the US city recently to take part in the Red Bull Peachtree Drift Battle. Quite why this kind of closed street thing doesn't happen in the UK we don't know, but it's a fair bet that our commute would be a bit brighter with balletic tyre smoke added.